Every night, moreso on clear nights, the nightly illumination at the Tuckamore Lodge near Main Brook, Newfoundland shines across the wilderness landscape. As dusk settles in, the soft, yellow lights around the exterior of the lodge come on and allow the outside area to be enjoyed while listening to the calls of the wildlife. 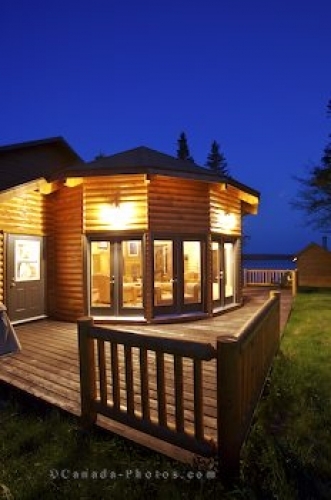 The Tuckamore Lodge is located in the wilderness of Newfoundland and is designed in a Scandinavian style with its beautiful wooden decks. The windows wrap around the lounge area of the lodge which can be enjoyed by all guests before retiring to their luxurious accommodations. Guests have eight rooms to choose from, each one having their own bathroom and a bed which is extremely comfortable for a peaceful night sleep while vacationing here. Fishing is excellent around the Tuckamore Lodge but for those who are not fishermen, Gros Morne National Park, viking sites, whale watching and iceberg watching tours are available within a close proximity. After a long day, the sight of the nightly illumination of the lodge and the quietness of the area is something guests adore while staying here. Picture of the nightly illumination of the Tuckamore Lodge near Main Brook, Newfoundland.